I was recently tasked with doing some MPI benchmarks on Amazon EC2 to get a general idea of how well EC2's Cluster Compute capabilities perform. 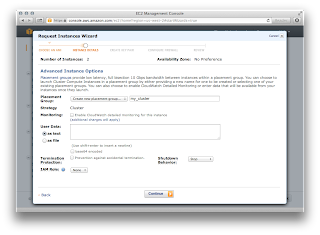 I had never used EC2 before, so the notion of setting up a working set of EC2 instances that have the necessary configuration to run MPI applications was initially quite daunting. 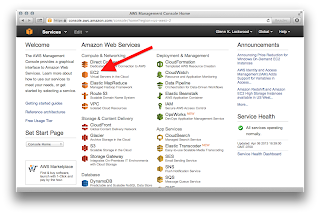 I had no idea what the difference between an AMI and an instance was, what AMI and instance to use, and if I should mess with any automatic provisioning/configuration tools (like Starcluster) to quickly spin up a cluster. Most guides online are kind of unhelpful in that they try to illustrate some proof of concept in how easy it is to get a fully configured cluster-in-the-cloud setup using some sort of provisioning toolchain. They gloss over the basics of exactly how to start these instances up and what to expect as far as their connectivity. 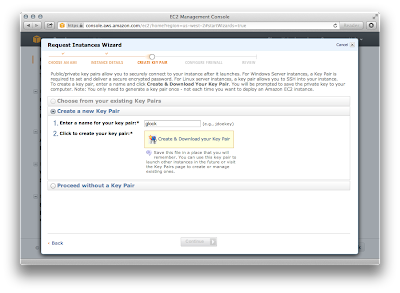 Fortunately it only took me a morning to get MPI up and running, and for the benefit of anyone else who just wants to get MPI applications running on EC2 with as little fuss as possible, here are my notes. It is worth pointing out that I use the term "instance" and "node" (or "compute node") interchangeably in the following discussion. This should take you to the EC2 Dashboard from where you can launch VMs. 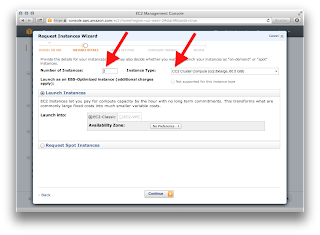 Click the big blue "Launch Instances" button to get into the wizard. I used the Classic Wizard. 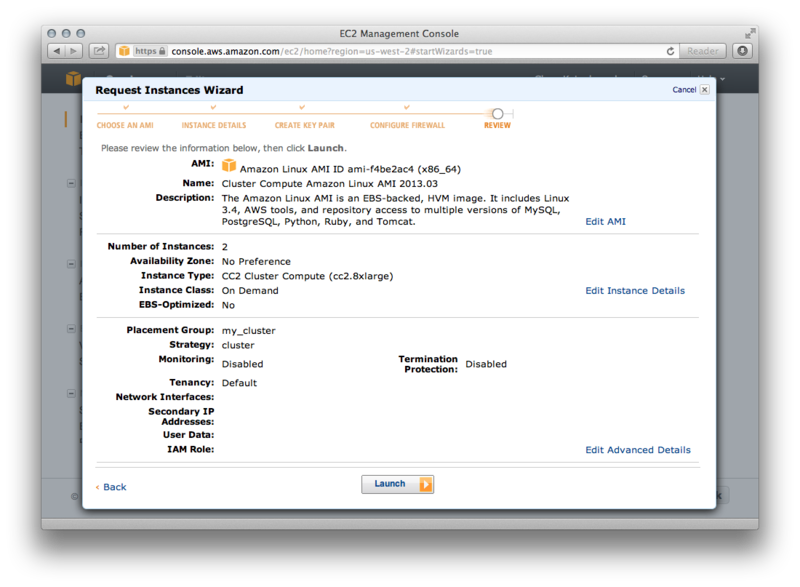 The first thing the wizard asks you to do is select an AMI (Amazon Machine Image). Scroll down and choose the Cluster Compute Amazon Linux ABI. This is sort of like a VM image that establishes your OS distribution, base software stack, and initial login user. 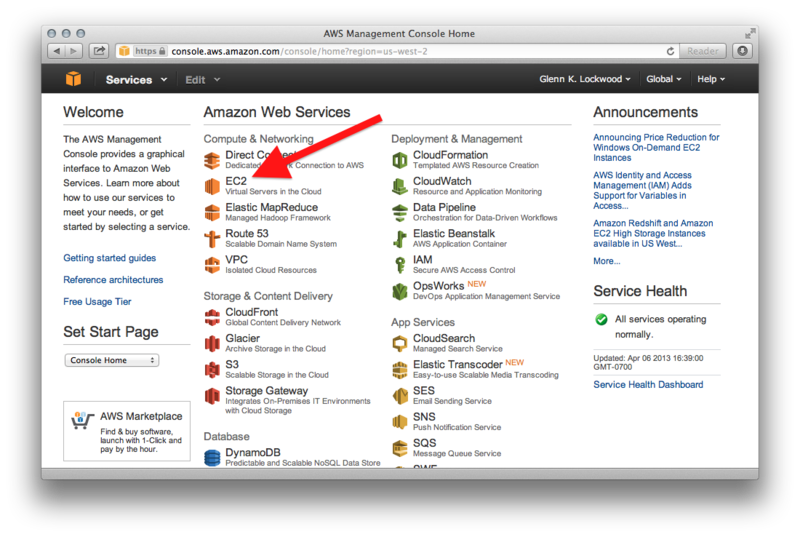 What threw me off is that there is a regular "Amazon Linux" and the "Cluster Compute Amazon Linux," yet they both have the same description.  As far as I understand, the Cluster Compute image uses a virtualization layer (called "HVM") that is a lot thinner than the one used by non-compute images. You wind up getting an instance that runs on an entire physical compute node, and only the I/O adapters are virtualized. 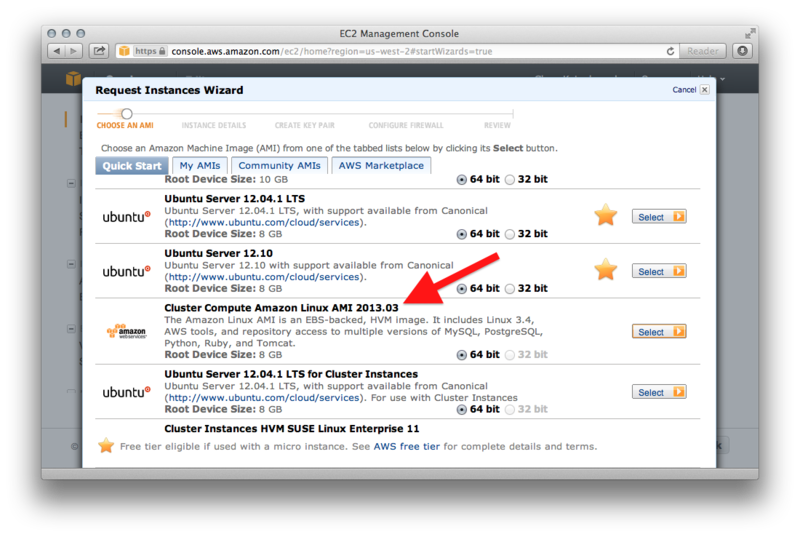 With that being said, this "Cluster Compute Amazon Linux" AMI says nothing about the hardware you want your instances to use. This next step is where hardware comes in. The cc2.8xlarge instance has a configuration reasonably close to what SDSC Gordon has: 2x Intel Xeon E5-2670 processors and ~60 GB of RAM per node, so that's what I chose. I also didn't want to run up a huge bill while I was getting this process stamped out, so I only wanted to launch two nodes to start--the minimum necessary to test MPI communications. 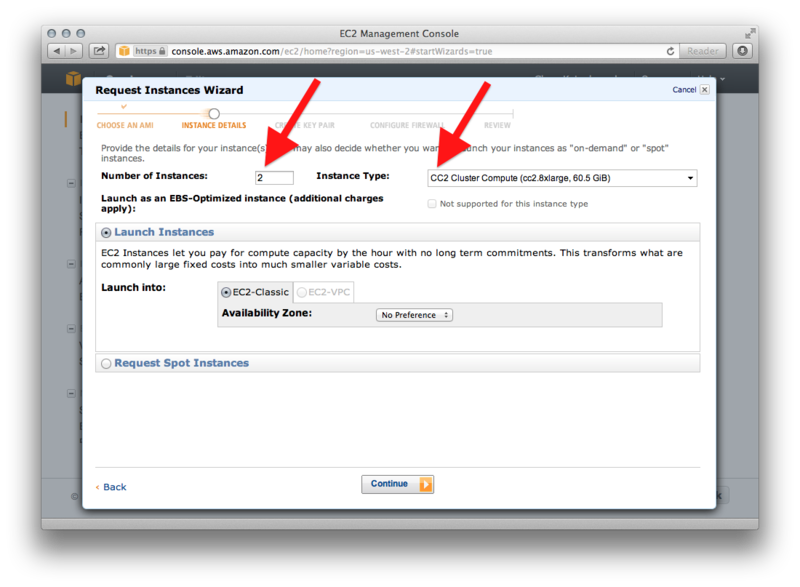 Also, Amazon lets you launch these instances like normal at a rate of $2.40 per instance per hour, or you can potentially get a significantly discounted rate by using spot instances. Despite the possibility that my spot instances could be shut off at any time, the 90% discount was worth the risk so I went with the spot instances and bid the absolute lowest rate. 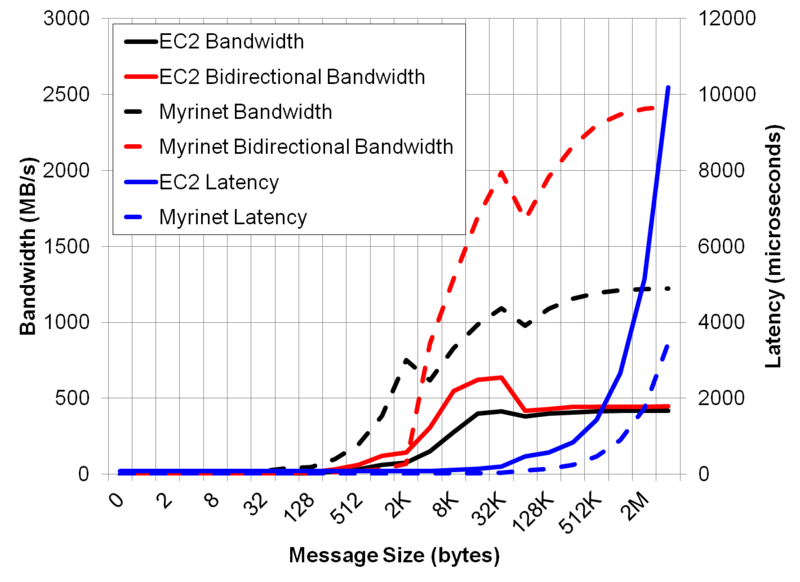 This turned out to be sufficient to have these virtual clusters running for a few hours, and I've never actually seen the spot instance bid rise above the value we paid. I guess these things are not in high demand. 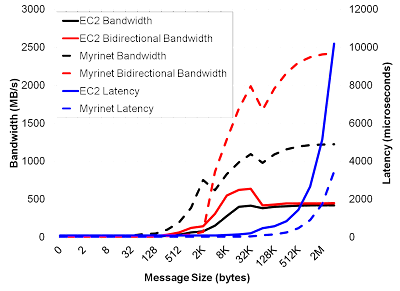 For what it's worth, the entire exercise of figuring all of this EC2 stuff out on a 2-node cluster, then spinning up a 4-node cluster and running a specific application benchmark only cost us $3.04. Either way, the next step is to define the instances' Placement Group, which is a critical component. Instances which are on the same placement group share the same network subnet and get the full bisection bandwidth available to these Cluster Compute 10 GigE connections. Give this cluster's placement group a name, and if you want to add nodes to this cluster on the fly later, you have the possibility of starting more instances and requesting that they be added to this same subnet. The User Data field is unimportant for our purposes, and you may want to change the Shutdown Behavior to "terminate." This will ensure that you aren't being billed for the VMs while they are "stopped" but not "terminated." The next step is defining your instances' storage volumes.  Even though the Cluster Compute AMI is backed by EBS (block storage), I don't think it's persistent since persistent EBS typically costs additional money. I accept the defaults here, but you can change the "Delete on Termination" value to false. It appears that AWS charges you all of the regular EBS rates for the default (required?) EBS-backed root volumes used by the Cluster Compute instances, so it might be possible to make the disks on these instances non-volatile. I haven't played with this very much though. If you have the money to burn, you can create a persistent EBS store and NFS-mount it across all compute nodes. I quickly cover how to do this at the bottom of this guide. The next screen lets you define tags to manage your instances. This is not necessary for this simple test, so just continue past this screen. 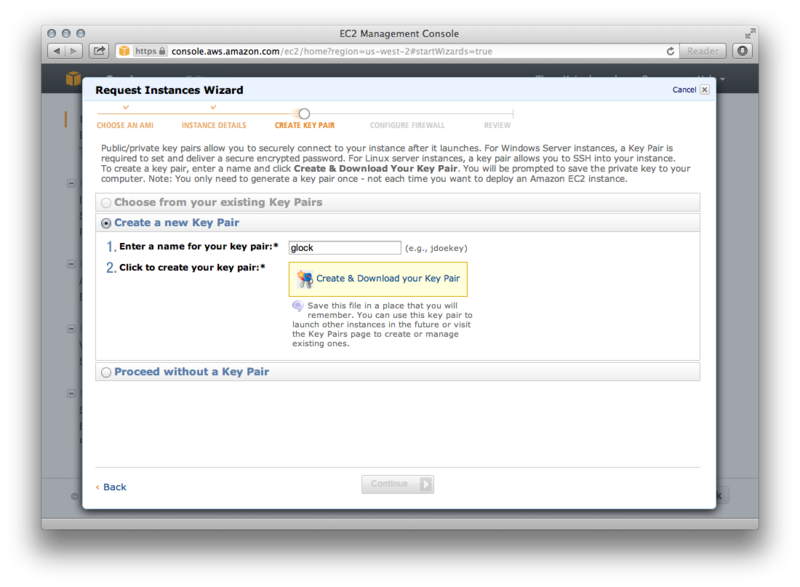 The next step, creating your key pair, is critical to being able to get into your instances once they boot up. Give your key an arbitrary name, then download it as a .pem file. This is the privatekey that will allow you to ssh into the instance once it's up; if you don't have this, you will simply be locked out of your own instance. 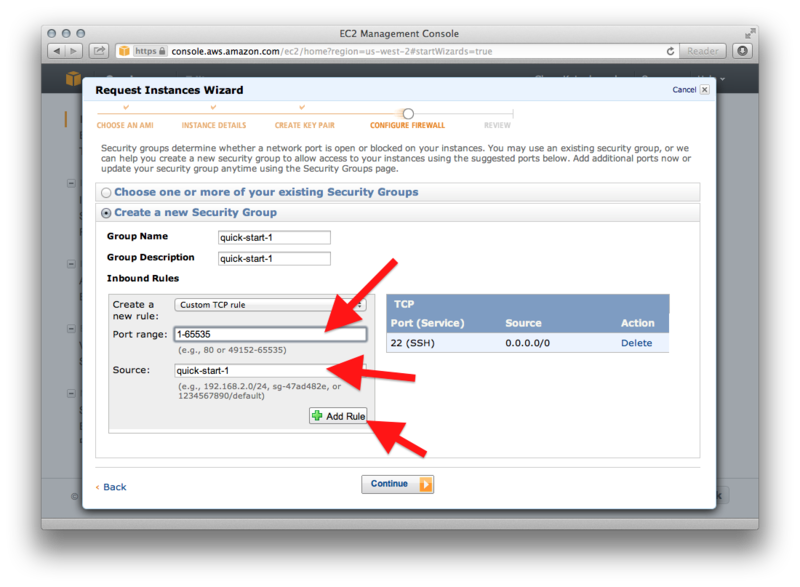 The next step of customizing your cluster's security group is also essential. The default behavior of the wizard is to have you create a new security group called "quick-start-1" that will open port 22 (SSH) to the world but block all traffic everywhere else. 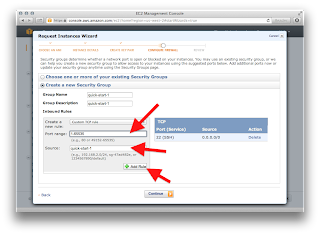 You need to let all instances (nodes) within your cluster communicate freely for MPI to work, so you must add a new rule to this security group that opens all ports (1-65535) to all other instances within the same security group (quick-start-1). Once you enter these two parameters, you must then click the Add Rule button or this rule will not be applied and MPI will not work! This is the end of the instance wizard. Click Launch, and your instances will begin booting up. Go back to the EC2 Dashboard and wait for your VMs to reach the "Running" state. 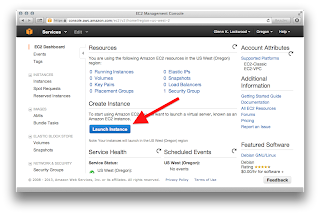 Once logged into the instance, getting set up is a pretty quick process. The general procedure involves making changes on a single, master node (whether that be install packages, compile software, upload data, etc) and then push those changes out to all the compute nodes by hand. This is a very rough approach, but when it comes down to it, you don't need very much to get MPI running. The goal here is to do as little as it takes to run an MPI benchmark across Amazon EC2 Cluster Compute nodes. 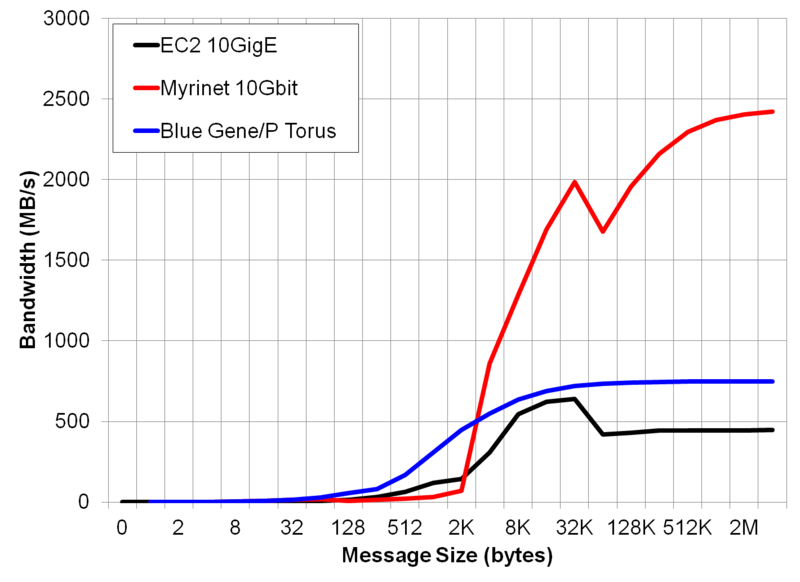 The Cluster Compute instances are a "cluster" inasmuch as they are all booted to the same OS and all share the same 10 GigE subnet with full bisection bandwidth; on the software front, there is close to nothing that makes the instances a cluster when they are booted up. The very first thing I did was set up a few things as a matter of convenience. Add all nodes' internal IP addresses (10.x.x.x) to /etc/hosts under aliases like node2, node3, node4, etc. This test cluster has only two nodes, so only two entries need to be added. If you want to get fancy, you make a similar script to execute a command across all nodes as well. Transfer the .pem onto the nodes so they can use password-less ssh to communicate. I copied mine onto all my instances as /home/ec2-user/.ssh/id_rsa so that ssh/scp used it by default. Be sure to then push this new .bashrc file out to all of your compute nodes or your mpi jobs will throw "bash: orted: command not found" errors as soon as you issue mpirun. The hostfile format is a little different for mpich's mpirun, but using mpich instead of OpenMPI is much the same. Sharing this filesystem across the nodes is pretty simple, and you don't really need a separate EBS volume to export a filesystem over NFS. You can just mkdir /ebs and use the volatile root EBS volume that comes with your instances if you don't want to mess with adding EBS volumes. This then saves the hassle of having to sync up runtime files across nodes. 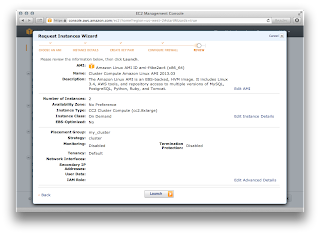 If you used a persistent EBS block store underneath this NFS share, you can also terminate/restart your instances without having to spend the money and time on EC2 bandwidth into and out of the cloud.